The 5th Gen RAV4 should be at some dealers this week or if not real soon. Let's see what kind of deals are out there. Please list your sales price before tax, title, and license as those vary city to city. Won't have the paperwork until I go pick it up and the wife signs, but here's what I went with. 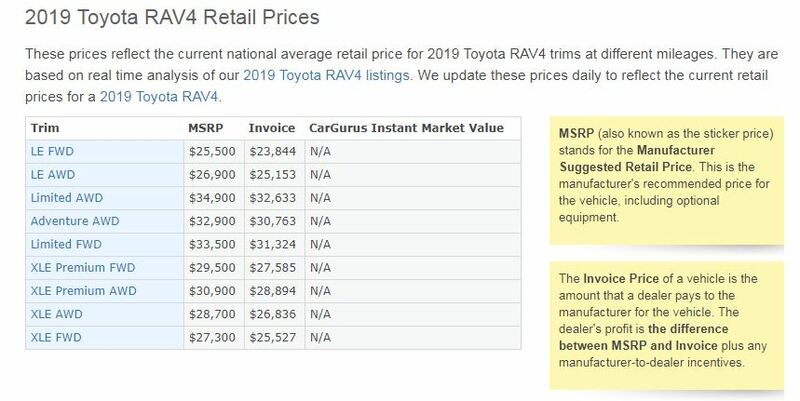 Via CarGurus, here's Dealer Invoice prices on the '19 Gas Models. Same as what I have ordered except I ordered gray interior with the JBL audio as well, and All-Weather Liner Package no mudguards or cross bars, I will put after market mudguards on later. $34,962 plus tax, title, license, possible additional off pending what promotions if any are running when it comes in. My dealer doesn’t charge any additional stupid dealer fees. Just got my first Rav 4 the first one in Tom's River NJ payed 32,000 traded in my 2016 tacoma trd off road. Xle in midnight black metallic. Avent seen it in sun yet got it last night. Lots of buttons to figure out. Here the pricing on new XLE that's showing in stock at Carmax's Toyota dealership. The discount off of MSRP is about 2750 for 2019. For 2018, it's about 5500+. I'd consider buying when the discount on 2019 is above 4000. 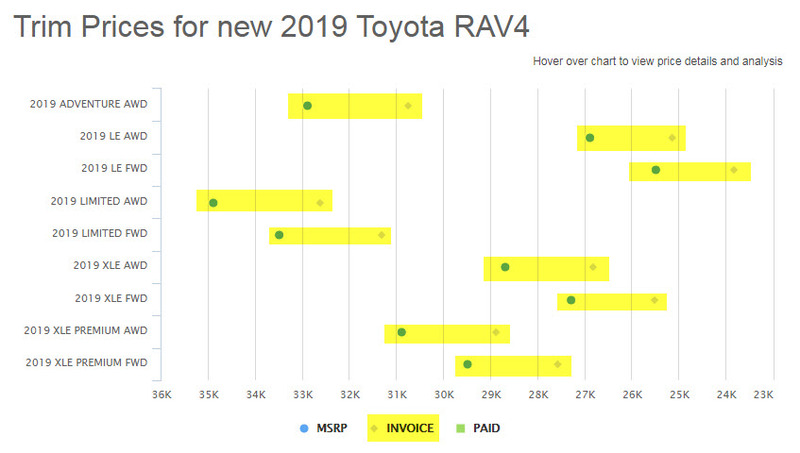 Looking at 2019 Highlander prices, it seems we will get there as well once most of the 18 inventory is cleared. FYI: The XLE I saw on Carmax.com a few hours ago is not avl. anymore. So, can't say what the detailed options were.